Stockholm dates back to the middle of the 13th century, and the Old Town is the original city. On Saturday, June 27th you’ll have a chance to walk – run if you like – in alleys, squares, along the water. past churches, palaces, and monuments and see for yourself what a 750 year old city looks like. We’ll start at 6 PM (registration begins at 5:30 PM) but since the sun won’t set until 10:08 PM there’s no need to bring a flashlight. This will be an event for everybody whether you know about orienteering or not. We’ll meet on Riddarholmen (Knight’s Island) by Lake Mälaren. It’s an easy 15 minute walk from the Central Station. There will be a briefing and beginner’s clinic at 5:45 PM before we start. Teams will start between 6:00 and 7:00. There are plenty of places to eat nearby for after the event. This will be like the Traveling Salesman Problem (actually, a variant called the Prize-Collecting Traveling Salesman Problem), in that you try to optimize the route for your team. Checkpoints will be marked on the map; you may visit any subset of checkpoints you like. Each checkpoint you visit earns you points; your task will be to find as many as possible to maximize your score. Checkpoints will be placed all over the Old Town. You’ll have a 90 minute time limit; after that you’ll incur a late arrival penalty for every minute you’re late. If two teams have the same score, the fastest one wins. You’ll get preprinted course maps, a clue sheet /punch card, and a set of notes about the places you’ll visit. Check-in: Starting at 5:30 PM. Distance: Depends on you, but 3 km is a fair guess. Our start/finish is located on the west side of Riddarholmen (Knight’s Island), a small island west of the main part of the Old Town. It’s an easy walk from the Central Station, about 800 m south of the station. From the Central Station walk south about 250 m from the main Station entry at Vasagatan, just south of the SAS-Radison hotel, following Vasagatan and staying on the west side of the street. Cross Tegelbacken at the light where it passes under the railway on your right. On the other side turn right, and pass under the railway on the pedestrian walkway along the water. After the underpass turn immediately left (south) and follow the pedestrian bridge next to the railway. After about 250 m, Riddarholmen will be on your right. Turn right on to the island and follow the water about another 250 m to the Start. Anybody coming by subway (T-bana) should go the station “Gamla Stan” on the Green or Red lines. As you come down the stairs from the platform and go through the ticket barrier, turn right, and you’ll exit on Riddarholmen. Turn right again and walk about 300 m along the water to the Start. Anyone coming from the east can cross the channel separating the main part of the Old Town and Riddarholmen on a bridge at Myntgatan. From the northern side of the Royal Palace walk west by southwest, and you’ll find the bridge. Keep going west down to the water and the Start. Course setter: Leif Lundquist, member Enebybergs IF, Sweden and Tucson Orienteering Club, Tucson AZ. P.S. Orienteering started in Sweden in the late 19th century. You can read more on ( http://en.wikipedia.org/wiki/History_of_orienteering ). The City and County of Stockholm invites conference delegates to the City Hall of Stockholm for the ISMB/ECCB 2009 opening reception. 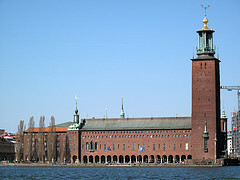 The City Hall of Stockholm is one of the most beautiful and well-known buildings in the world and the most exclusive ballroom in Stockholm. Each year the Nobel Banquet is held here. City Hall is a short distance from the Central Train station and is easily identified by its famous tower. The conference closing dinner will be held at the Vasa Museum, Scandinavia's most visited museum. 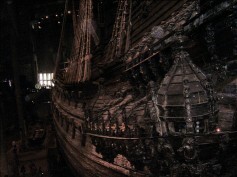 The Vasa is the world's only surviving 17th-century ship and one of the foremost tourist sights in the world. This evening will be sure to be a conference highlight. The dinner and entrance to the Vasa museum are included in conference registration and additional guest tickets can be purchased for a cost of 75.00 Euros (includes VAT) during the on-line registration process. Buses will depart from the Stockholmsmässan (Stockholm International Fairs) and will travel direct to the Vasa Museum. 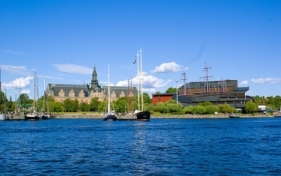 The Vasa Museum is easily accessible by taxi from city centre hotels. Buses will depart the Vasa Museum and take delegates to official conference hotels. 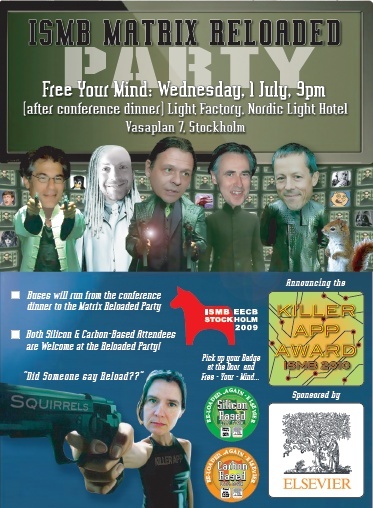 This service will begin at approximately 9:00 p.m.
Delegates are invited to participate in the dinner after-party at the Nordic Light Hotel sponsored by Elsevier. The dance party will be held in the Light Factory. Delegates can use the post-dinner shuttle buses from the Vasa Museum to the downtown to access the hotel.